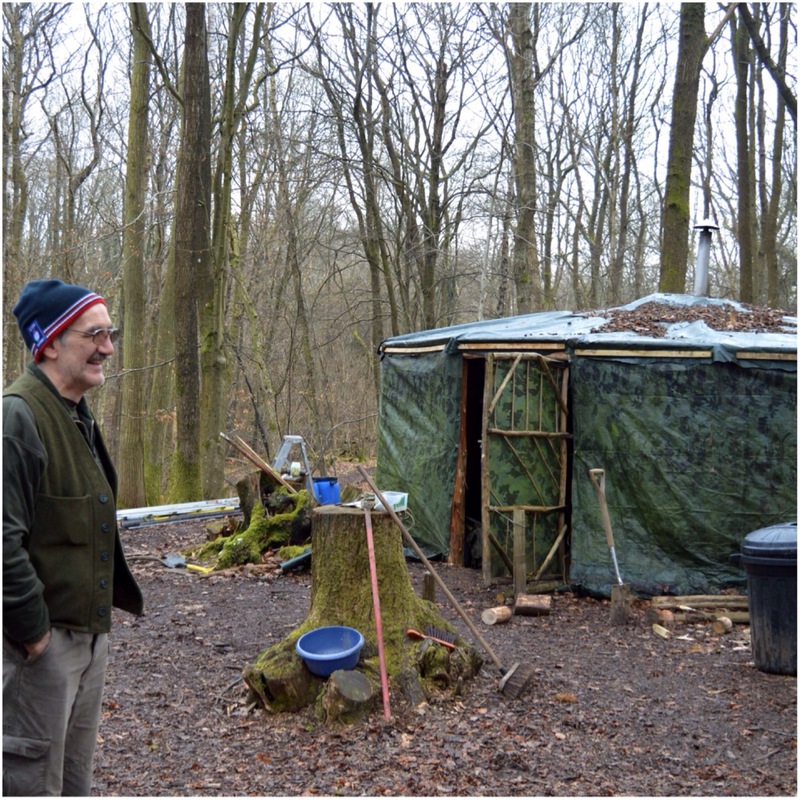 If anyone reading this has been on one of the Woodcraft School courses run by John Rhyder at his woodland site in Hampshire you will certainly remember the roundhouse. This little building has been a refuge on many a cold night for many people including myself. Every now and then the roundhouse needs a bit of TLC. John had recently replaced the roof beams, so now it was the turn of the walls. 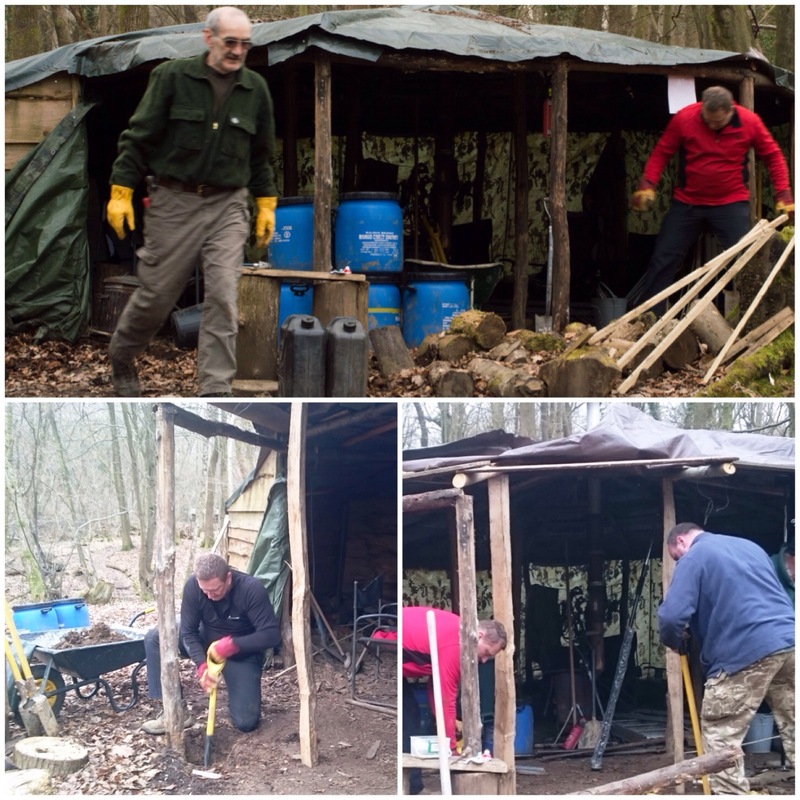 A group of us who are all ex students of John’s agreed to spend the weekend with him working on improving the camp facilities at his woodland HQ. 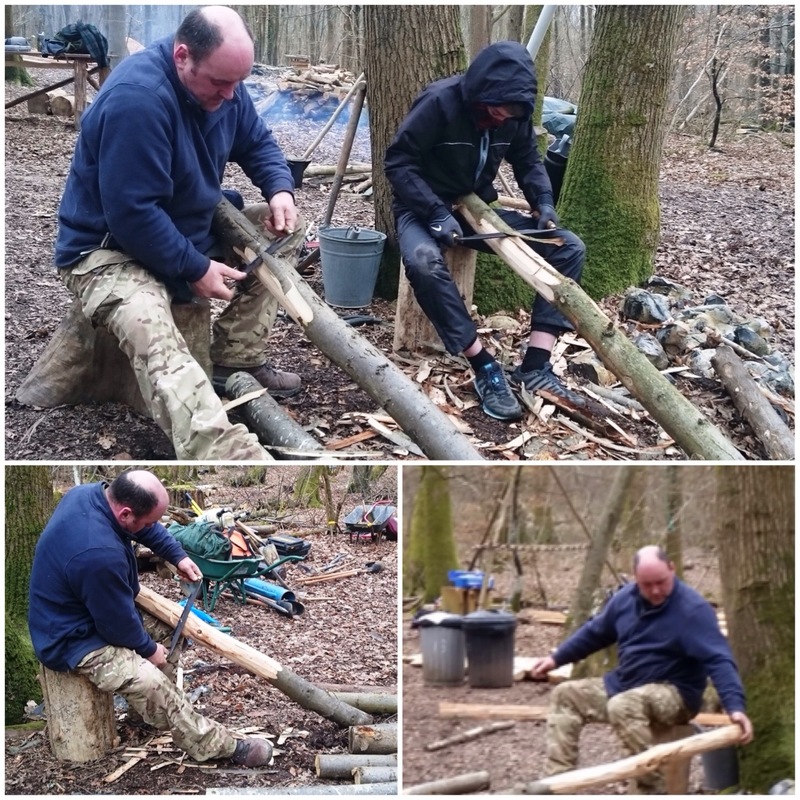 I was not involved in working on the roundhouse (I was helping to build the new kitchen and raised fire pit) but I did get a number of pictures of the guys working on it. 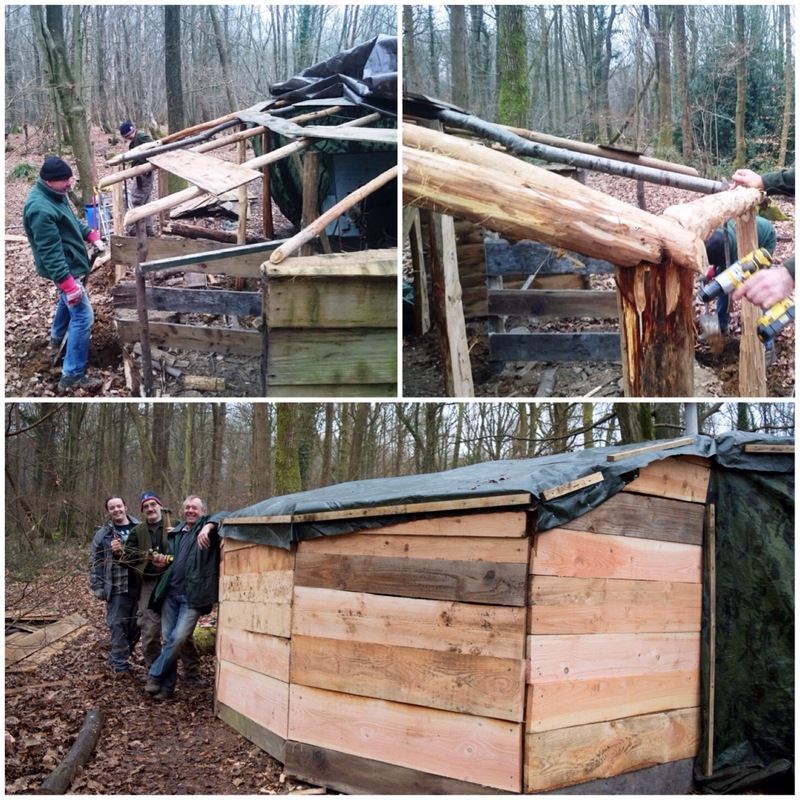 Working on the roundhouse were Charlie Brookes, Keith Bosely, Scott Batty, Jack (aka Warren Frost) and Pete Bastable, helped from time to time by Fin Rhyder. The guys stripped the tarps away from the sides to expose the outer ring of poles. They were well worn but some were showing signs of damp at the base. 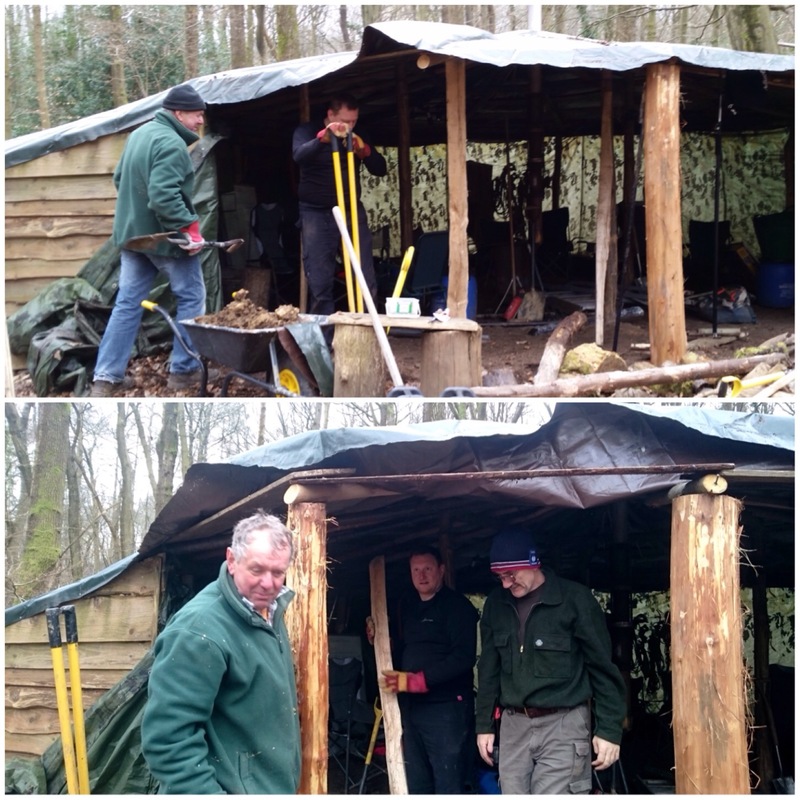 The guys started in one section by putting braces in to keep the roof in place and then dug out the outer pole for that area. They would then slot in a new piece of split sweet chestnut and trim it to size. You can see all that happening in the pictures above. 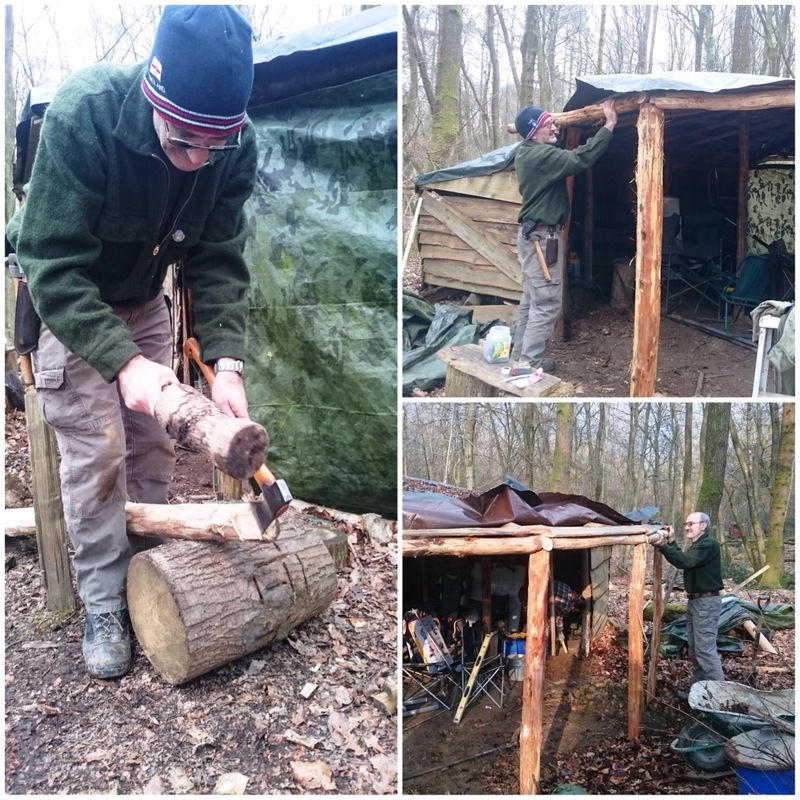 The new uprights had already been split and de-barked so Pete and Fin got to work de-barking the poles that would be uses as lintels between the uprights to support the roof. Soon the guys had a few of the uprights in place and they put some temporary lintels in place until the permanent ones had been finished. After the lintels had been debarked, the lintels ends were carved so that they could be attached securely to each upright. This involved a bit of axing out to produce a flat platform at the end of each lintel. The door of the roundhouse also got a makeover and was rebuilt to fit in with the lintel above it. Also as each section was finished the tarp walls were put back securely in place with some battons. 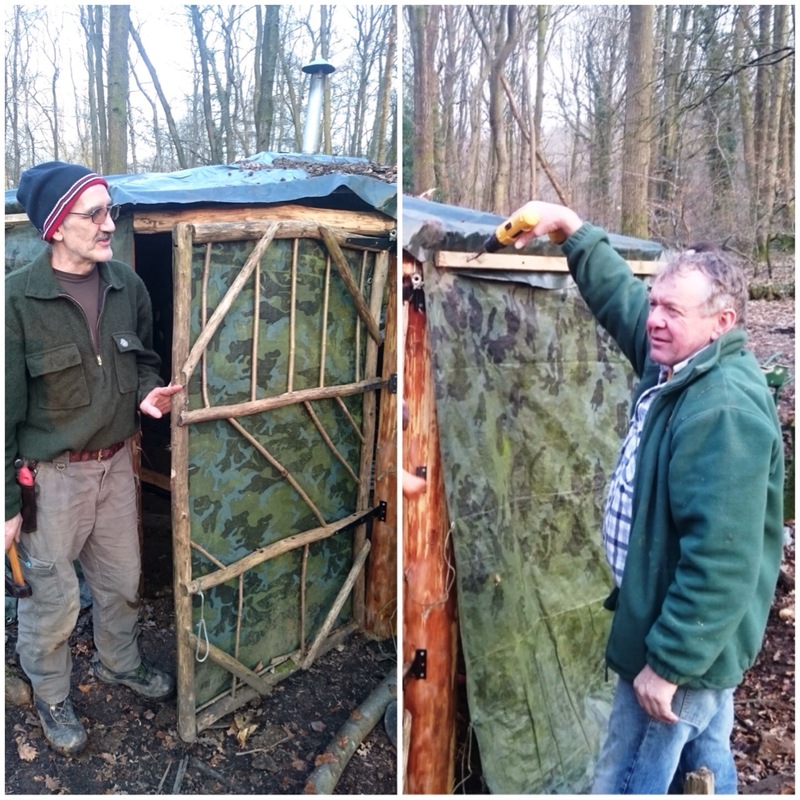 John uses these tarp walls as they can be easily rolled up in the summer to give good airflow through the roundhouse. The roundhouse has a small extension at the back covered in wood instead of tarps on the walls. This area is used for storing wood for the stove . The uprights and lintels were replaced here but the wood panels had deteriorated so they were stripped off as well and replaced. I think the guys did a good job of this area making it secure and water tight in a very short period of time. The job took the guys a day and a half to do and by the Sunday afternoon the outside of the roundhouse was looking good and strong again. At some stage John will be adding new shingles to the roof as tiles instead of just the tarp they have at the moment. This is just a brief summary and no doubt misses out many of the issues they faced as I did not work on this project, but I do know they did a cracking job. i won’t take offence being missed off the list of people working on the round house. After all I did have to do a runner mid afternoon. Sorry about that buddy. I know you said offline not to change the post but I insist on updating it as you did a massive amount digging out of all these post holes.